To be continued - Patent my French! The new normal - Patent my French! on The “pays” of the PIs? I think it is high time to wish all readers of this blog happy holidays. 2018 was an eventful year in the small world of European patent law, and there is little doubt that 2019 will be as well. Before you go, here is a short summary of a few things to watch out for in the coming year – so that you can ponder over those and make your own 2019 predictions while indulging in device- or apparatus-shaped chocolates, or while humming typical Christmas songs such as “we wish you a valid patent, we wish you a valid patent, we wish you a valid patent, and a happy new grant“. Let me start with the topic of last week’s post, the new mandatory web-based filing system implemented by the INPI. Let’s hope that it will improve next year and become more manageable and user-friendly. Two side notes on this topic. One, the INPI guidelines have now been updated to reflect the new filing procedure. You can download them here. Second, there was an interesting discussion in the comment section of the post. There seems to be a strong argument that the Patent Law Treaty makes it impossible for the patent office to prohibit paper filing. One reader reported that, in one of his cases, the INPI accepted a paper filing when the representative insisted. But there has been no communication from the office on this issue. The updated guidelines no longer mention paper filing, and neither does the decision of the Director of the INPI which sets up the new system. Hopefully we will get some clarification in the near future. And while we are talking about the INPI, there is actually a lot going out right now, as reported in one of my previous posts. Will the legislative reform be successfully completed? What will the French opposition proceedings look like? Will there indeed be a full examination of French national applications? If the current expectations are confirmed, this will be an upheaval of French patent practice – but so far the always important practical details have not been forthcoming. Things are also moving on the SPC battlefront – aren’t they always – with a number of important pending references to the CJEU. Just a few days ago, the opinion of the Advocate General in Abraxis (C-443/17) was issued, and it calls into question Neurim (C-130/11), which is one of SPC applicants’ favorite CJEU rulings. See a full report by Alexa von Uexküll and Oswin Ridderbusch here. We’ll see which way this one goes. And perhaps one day we will finally get to understand what a “product” is – almost a philosophical question. 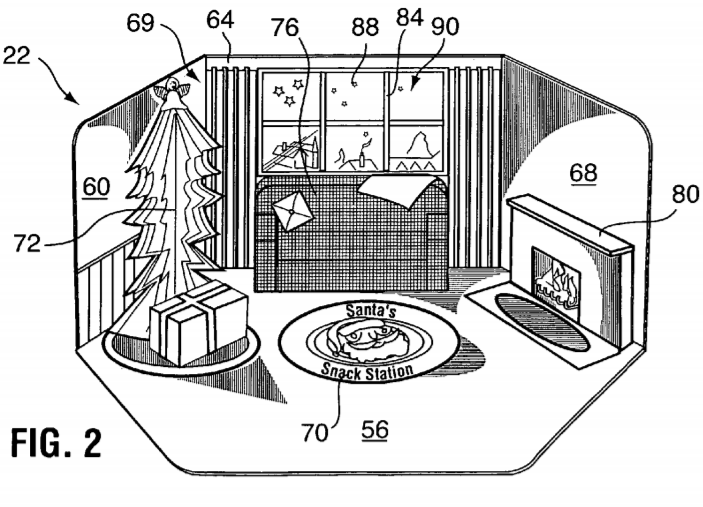 “A kit for creating an illusion that suggests a Santa Claus visit”. Wait a minute? Is Santa Claus just an illusion? Turning now to the EPO, no upheaval in sight, but still some interesting developments. First, the new version of the Rules of procedure of the Boards of appeal will likely be finalized soon. As noted by a number of colleagues, such as Adam Lacy and Thorsten Bausch (here), this will likely make the lives of many parties in appeal proceedings more difficult. One side remark again: when I reported on T 1914/12 (which by the way does not seem to be very much followed by other Boards, see Peter de Lange’s blog here), I wondered whether the proposed revision of the rules of procedure could potentially be considered as breaching article 114 EPC, if one were to adhere to the reasoning of Board 3.2.05 in this decision. Any thoughts on this? Next, a new online user consultation has been launched by the EPO regarding the possibility of a postponed examination option (see here). A very recurring subject indeed. We’ll see whether and how it progresses in 2019. Last but not least, the broccoli / tomato / bell pepper battle is still raging at the EPO. Remember that it was decided in G2/12 and G2/13 that the exclusion of essentially biological processes for the production of plants from patentability does not preclude patents on the plants themselves. But the European Commission subsequently expressed its disagreement with this position, which led to the amendment of R. 28 EPC in July 2017. And then bang! Board 3.3.04 in T 1063/18 decided that amended R 28 EPC violates art. 53 EPC. See Laurent Teyssèdre’s report here. It is quite difficult to predict where things will go from there. As a consolation, faithful readers of this blog will be satisfied that Lionel Vial correctly anticipated some of the current difficulties with the application of amended Rule 28 EPC one and a half year ago. Are you skeptical? The evidence is here. German Bundesverfassungsgericht would issue a decision on the constitutional complaint in December, but you know how it is with UPC-related rumors. So I would be surprised if we had a decision under the tree on Christmas morning, and the suspense will likely continue for some time. Come March 29 and the actual Brexit, it is clear that the plan will have to be reworked. That’s all folks, season’s greetings to all!